The truth is that for many of us, the family garage is just a place to pile up our stuff. In fact, it's been estimated that less than 20 percent of homeowners and renters in the United States use their garages to park their cars in. This is not because we prefer to keep our cars parked out in the elements during the day and overnight. It's because most of us have no room in our garages for a car, let alone two! The major issue for most people when it comes to garage storage is with how to best use the space that's available. This is even more of an issue with small, one car garages, but it's still true for the larger, three car structures on many homes. Most garages are not built with shelving and closets are rarely included except, perhaps, in a custom built home. But simply piling boxes, storage containers and piles of stuff doesn't work well. Maximizing the available space is a challenge and somewhat problematic. For example, any doorways into and out of the garage have to be kept clear, and the large garage door, or doors, must be avoided, as well. The end result is often unsightly, disorganized piles of stuff crammed into the open area of the garage, with a narrow path or two between doors. This is, of course, highly inefficient, awkward to move around, and even dangerous. Piles have been known to fall over and there is also the increasing fire danger as junk piles up everywhere. And, over time, we have a tendency to accumulate and hoard, Which leads to more stuff, bigger piles, and less space. At some point you realize things have gotten out of hand. You can't find things you need, you can't reach things you want, and you trip over stuff that should be tossed out. That's when it's high time to begin organizing and eliminating. Before you consider building, installing or paying for storage solutions, you need to winnow out the junk from the good stuff. Staging, categorizing and separating your belongings is essential for good organization when it comes to cleaning the garage. While it is easiest to use the driveway or yard for this step, it might be possible to do this inside the garage itself. Begin by separating out anything and everything that you do not want to keep, or are even uncertain about. You can always change your mind later. This step is a big part of this process. 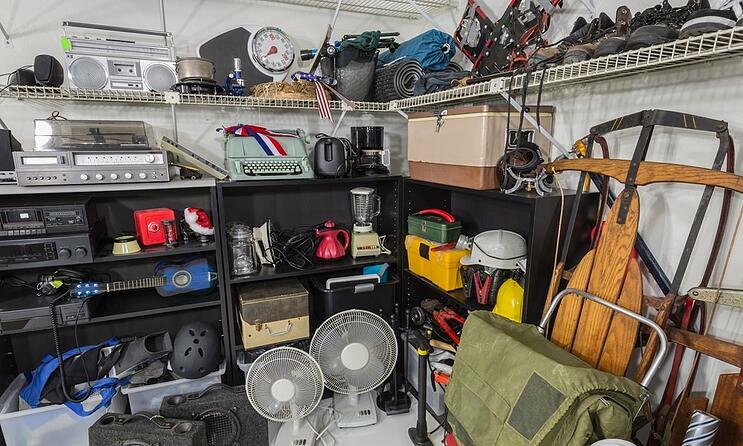 The items you know for certain you want to be rid of can be sold through sites such as Craig's List or eBay, donated to local charities, or simply given to willing neighbors who can then store them in their own garages! After you have sold off everything you can possibly can, set the remainder aside for a Short of selling or donating these items, you can always call on a reliable junk hauling service like Junk King. The important thing is to reduce the overall quantity of stuff in your garage before setting up storage options. One of the best methods, of course, is to provide shelving. Simply putting everything that fits into plastic storage containers, for example, is a good start, but these can only be stacked so high before creating a different hazard. Storing everything on shelves is a far more efficient and safer method. The goal is to store "up", not all over. Shelving allows you to accomplish this. Part of the beauty of a garage, of course, is that it easily lends itself to a variety of shelving methods. And the space used for shelves is only limited by the height of the ceiling, the number of doors taking up wall space, and the methods used. These can be anything from kitchen or bathroom cabinets that have been re-purposed for your garage, to high-end systems especially designed to be used in the garage. While this option is usually the costliest, it can also be the most appealing visually and provide sufficient "out-of-sight" storage for most homeowners. Aside from the cost and the need for installation, a disadvantage is that these are fixed in place and somewhat limited in capacity. There are an abundant variety of shelf units that can be purchased from department stores and big box hardware outlets. These range from all plastic shelves that are usually designed for lighter weight storage, to professional-grade units built to withstand almost anything. Typically, the stronger the shelf unit the more weight it can hold, but also the higher the price tag. Units that are open shelves without sides, backs or doors, can be quite versatile in that they provided great access and can be re-positioned throughout the garage, if need be. Many homeowners find that building shelves along the walls of the garage provide the best of both worlds for storage. These shelves cannot fall over like free-standing are prone to, especially in earthquake states like California. In addition, they can be built all the way to the ceiling, providing maximum storage capacity. Shelves built along the walls can also be designed to run above doorways and with alternating heights between shelves. One more option that can be utilized is the empty space in the ceiling of your garage. This requires sufficient hardware to secure the shelves properly, but it allows a homeowner to make use of overhead space efficiently and "out-of-sight." These units should be reserved for items that are a) not excessively large or heavy, and b) not used and accessed very often. Ultimately, when all your stuff is separated and organized, you are bound to end up with stuff that needs to be gotten rid of. And if you haven't been able to sell it or donate it - or don't want to take the time to do so - then you need the services of a good junk hauling firm. Hauling services for large and bulky amounts of junk. House cleanouts for moving, spring cleaning, converting rooms, or just getting a clean slate. Property cleanouts for landlords, real estate agents, or inherited homes full of old belongings. Our residential junk removal services provide an easy solution for clearing out clutter and hauling away unwanted junk. People love Junk King because we provide the highest level of professionalism and fantastic customer service. You get a no-hassle experience with upfront pricing, easy scheduling, and fast service. Schedule a no-obligation appointment, and when you say the word we’ll haul away the junk and sweep everything clean. Junk does not have to end up in a landfill, and Junk King believes in recycling every bit of material possible. You can feel good about doing the eco-friendly thing when you work with us. We also send usable items to local non-profits and donation centers to help the community and reduce waste. One person’s unwanted furniture or electronics may do a stranger a world of good! Our professional and insured trash removal team will show up at your home or office; we call 15 minutes before we arrive on site and we’ll give you a free estimate based on how much room your items take up in our truck. 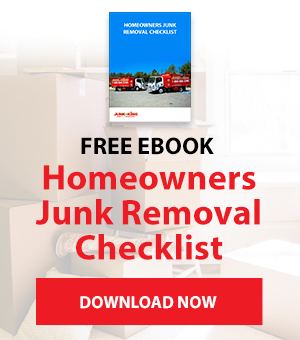 You point and we haul your items into our junk removal trucks, with no hidden fees.